Desh 17 November 2015 magazine is West Bengal's monthly literature magazine which is published from Kolkata in India. 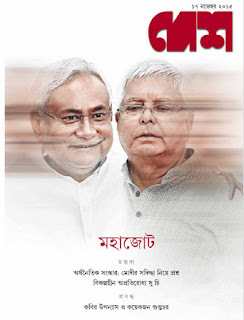 This edition's inner topics are specially about Political movements in Bihar, The Grand Alliance Nitish Kumar and Lalu Prasad, Economic Reformation , many novel of famous writers, science etc. View or Read this Desh Magazine.